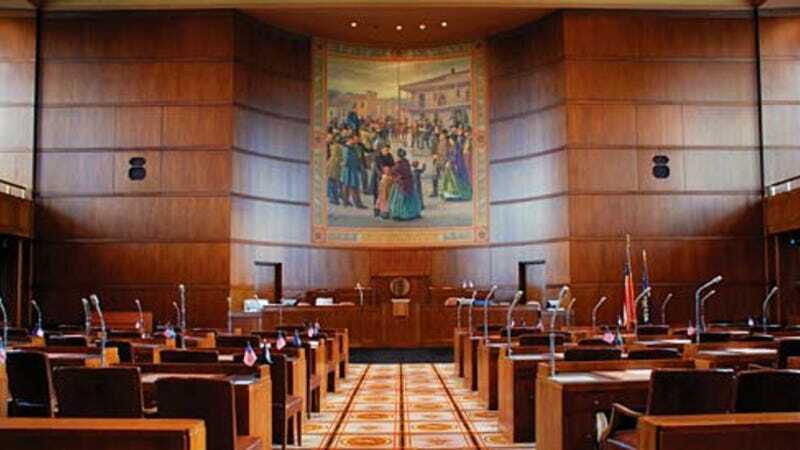 Oregon's senate passed a bill Wednesday that would eliminate the use of coal-fired power in the state by 2035 and stop its two largest utilities from paying for coal power altogether. The bill has already been passed by the state's house, and now awaits approval from Gov. Kate Brown. It would be the first state in the country to take such a measure. Portland General Electric (PGE) already plans to close Oregon’s only coal power plant in Boardman by 2020 and stop purchasing coal power from out of state, the Portland Tribune reports. But the bill will ensure PGE follows through on that plan, and it will force PacifiCorp to stop buying out-of-state coal power to serve Oregon customers. The bill also requires PacifiCorp, Portland General Electric and any new municipal electric utilities to get 50% of their power from renewable sources such as wind and solar by 2040. The goal is to prevent utilities from replacing coal plants with natural gas-powered ones, the Tribune reported. The bill passed on a party-line vote, with Republicans saying it would drive up costs for power users. “You don’t have to be a climate denier to dislike this bill,” said state senator Ted Ferrioli according to The Guardian. But advocacy group Renew Oregon praised it as a victory for a diverse coalition of interests. "This legislation was proposed by an unusual group of environmentalists, clean energy job creators, ratepayer advocates and electric utilities," it said. "The idea that opposing parties can sit down and hash out their differences is the things should be done in Oregon. It’s an example of the Oregon way."